Here’s a free hand embroidery pattern for a single flower which would make a great accent on a quilt, on a handbag, on clothing, on any home items, or just to hang on your wall! The flower can be outlined in basic embroidery stitches, or your could go so far as to fill it in with long and short stitch or satin stitch. If you’re a beginner at hand embroidery, you might want to try some simple stitches to outline the flower – stem stitch, whipped running stitch, split stitch, or chain stitch would all work very well. French knots would work great for the dots in the center. The leaves could be outlined, or you could fill half of them with satin stitch, or you could do the whole leaf in fishbone stitch, which would look terrific. 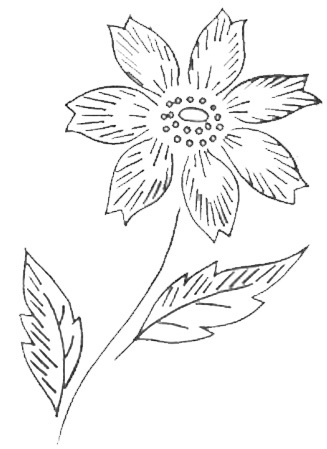 If you’ve been embroidering for a while and are familiar with long and short stitch filling, you could “needle paint” the flower using long and short stitch. Outline the petals first in split stitch, and then, starting on the outside tips of the petals, work towards the center, fanning your stitches to point towards the growing point on the petal. Vary the shading as you progress. Here’s the pattern. You can click on it for a larger image. Right click on the image to save to your computer, and you can scale it up or down in a photo editing program or on a copy machine. Have fun with it! For more patterns, including a list of online embroidery patterns, visit my free embroidery pattern index. I am a beginner and would like to know what you mean by fill leaves with the satin stitch?